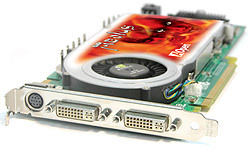 Most powerful next-generation VGA card, Aeolus 7800GTX-DVD256, built with NVIDIA's "Full-Throttle Graphics processor". The new VGA card is driven by NVIDIA’s GeForce 7800GTX graphics processing unit (GPU), embedded with CineFX 4.0 engine. The CineFX 4.0 engine delivers advanced visual effects at unimaginable speeds. The VGA card’s full support for Microsoft DirectX 9.0 Shader Model 3.0 enables stunning and mind-blowing special effects. The next-generation shader architecture with texture unit design streamlines texture processing for faster and smoother gameplay. Aeolus 7800GTX-DVD256 delivers almost two times (2x) the shading power of previous generation products taking gaming performance to extreme levels. The Microsoft DirectX 9.0 Shader Model 3.0 support ensures top-notch compatibility and performance for all DirectX 9 applications, including Shader Model 3.0 titles. The new texture core accelerates 64-bit floating point texture filtering, shading, blending for state-of-the-art high dynamic range visual effects. The architecture of the display card is designed for the next-generation Microsoft “Longhorn” operating system. Another great feature of the display card is its support to the SLI technology. The card delivers almost two times (2x) the performance of a single CPU for unparallel gaming experiences by allowing two graphics display cards to run in parallel. The SLI technology, which is the must-have feature for performance PCI Express graphics, dramatically scales performance on over 60 top PC games. When two graphics cards with both supporting SLI technology run in parallel for 3Dmark2003/2005 benchmark test, they always outperform a PC installed with only one graphics card. Therefore, buying the SLI card is no other than making an investment which are less likely to depreciate than cards with no SLI technology. The advanced visual effects engines of the card offer the most realistic gaming experience. The NVIDIA Intellisample 4.0 technology provides outstanding visual quality through gamma correct rotated grid antialiasing and advanced anisotropic filtering. The improved sample coverage (up to 128 Taps) improves quality of anisotropic filtering. Its support for normal map compression enables more lifelike characters and environments. The card’s PureVideo technology delivers digital home-theater quality video to the PC. The dedicated video processors of the card dramatically increase its video processing performance. The product’s enhanced HDTV processing provides 50% efficiency improvement and WMV9 1080p support. The card’s multi-threading video processing functions improve video output efficiency remarkably. Its MPEG2 video encode and decode delivers a stunning video experience, and WMV9 decode acceleration provides unmatched performance for Microsoft Windows Media Center Edition. The integrated HDTV-output brings content from desktop PC to your HDTV. In order to provide extra benefits to its users, AOpen bundles the new VGA card with gaming application – Second Sight (optional).